Welcome to Irish Traditions, Heritage and Folklore at SligoHeritage! "...Each age is a dream that is dying/ or one that is coming to birth..."
For the devotee of Irish history, heritage, mythology or folklore, County Sligo in the west coast province of Connacht, has everything. For those who take time to read the landscape, every stone and hill has its own unique, often bloody, story to tell. Here one can literally trace the dramatic tendrils of our nation, from mythological origins through a turbulent history to a modern nation. In its lofty mountains, its winding rivers, its jagged coastline, God has created here a land blessed by time and unspoiled by time or man. The mighty prow of 'bare Benbulbens head,' made famous by the poet W.B. Yeats, defines the County Sligo landscape. This is the 'Yeats' country', a countryside rich in history, folklore and mythology. 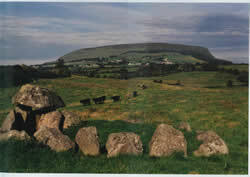 In Drumcliffe churchyard the poet himself lies at peace in the Sligo soil that inspired much of his work. My name is Joe Mc Gowan, host of this, County Sligo's only heritage site. My interest in heritage, folklore and history has led to the writing and publishing of several books on the subject. These web pages have been created to give the visitor an understanding, not just of Sligo's history, and heritage, but also a taste of current events. Unfolded here are the beliefs of ordinary people, their superstitions, customs and way of life. Our journey revealing the character of Ireland, and County Sligo in particular, is a microcosm, not just of Sligo, but of a romantic Ireland on the verge of extinction. In a series of articles the lives of historical figures and events will be told. The warp and weft of everyday people, their existence mostly uncelebrated and unsung, will be discovered here too. "St. Malachy: Patron Saint of Papal Prognosticators"
"Profile of an Irish Village"
"Classiebawn and the Assassination of Lord Mountbatten at Mullaghmore, Co. Sligo"
"Lissadell House, Coffin Ships, the Pomano and Sir Robert Gore-Booth" A saga of famine and coffin ships in Sligo... and on the same page: "The Story of the Voyage of Patrick and Margaret Burns..." New 26/12/'06: What the British PM said. "In all countries, more or less, paupers may be discovered; but an entire nation of paupers is what was never seen until it was shown in Ireland": For Gustave de Beaumont's view of Ireland in the mid 1800's go here and scroll down. See also what Prime Minister Tony Blair said about the Great Irish Famine. "…When first I came to Lissadell there was a kind of feudal system or tribute, between landlord and tenant. It was called duty work. Each tenant farmer had to give in work so many days in the year free." To keep up with Sligo Heritage; for Bealtaine:The Fire Festival and Mary or Baal? ; The Reewoge Days; How St.Patrick banished the last serpent; Imbolc/St. Brigid's Day: Links to the Christmas Mummers; A very Happy Christmas and New Year to all my Sligo Heritage readers; The Maryland Irish Festival; Ballintogher John Egan Festival; Cult of the Undead in Ireland? In Heritage archives:: Go HERE for text and pictures of the MUMMERS PLAY. For an explanation of the STRAWBOY tradition, scroll to bottom of page. Go HERE for a Youtube clip of the STRAWBOYS.